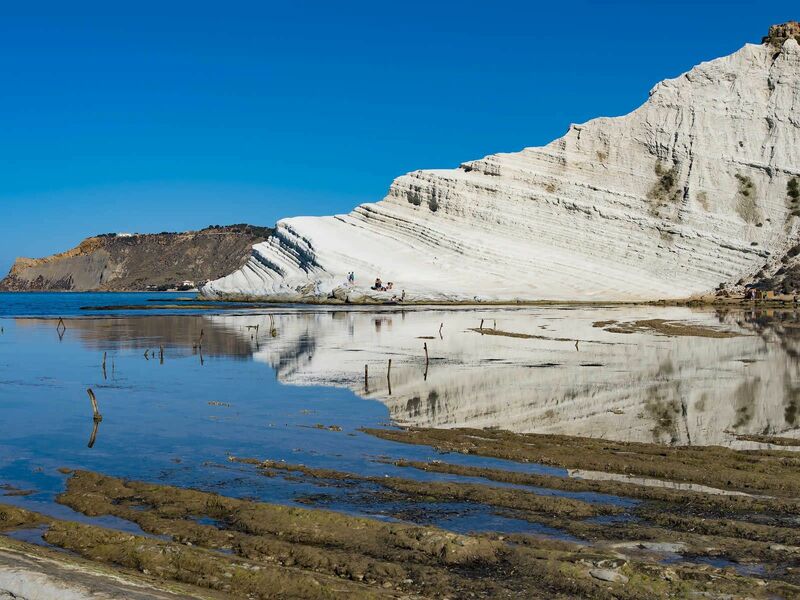 Along the coast of Realmonte, near Agrigento, there is an authentic pearl of the Sicilian sea, the Scala dei Turchi: a masterpiece of nature. Wind, rain and waves have sculpted this white cliff into the shape of a magnificent natural staircase. Along the coast of Agrigento there are many beautiful spots but the striking beauty of this place is truly unique. 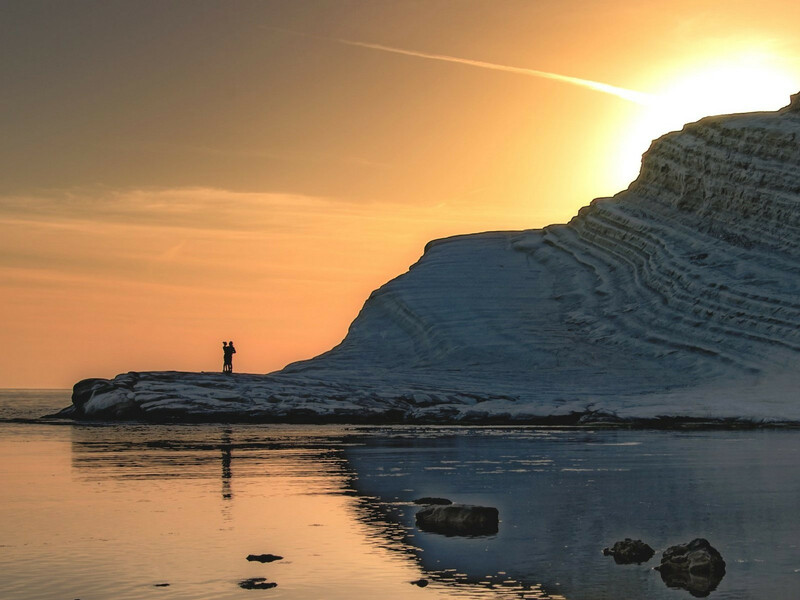 The name Scala dei Turchi refers to the raids of the Saracen pirates who landed on the beaches in 1500, climbed these cliffs and attacked the nearby villages. This extraordinary place has inspired many proverbs and popular legends, as well as the tragic love story of Peppe and Rosalia. In the sea in front of the Scala dei Turchi there is a rock known as “the lovers’ rock” (“u’ scogliu dò zitu e dà zita”, literally translated as “the rock of the lover and his beloved”). Its name derives from a local legend: the story of Peppe and Rosalia, an impossible love story with a tragic end. Rosalia was the lovely daughter of a rich inhabitant of Realmonte and on an afternoon, whilst taking a walk accompanied by her governess, she came upon a humble peasant carrying a heavy sack on his back: Peppe. The two exchanged a shy look and a furtive smile and fell in love at first sight. Obviously Rosaria’s father objected to the match and had no intention of wedding his daughter to a miserable country boy. Nevertheless Rosalia and Peppe managed to meet each other secretly in the shadows of Rosalia’s garden at dusk. It soon became clear that their love could have no future and Rosalia’s appetite weaned. Worried by his daughter’s ailing health, Rosalia’s father consulted a doctor who diagnosed “melanchony” and prescribed long walks in the open air. Nothing could have made Rosalia happier as the rambles in the countryside became a new occasion for her to meet her beloved Peppe. Unfortunately her outings were not unaccompanied and it didn’t take her governess long to discover the reason for the girl’s quick recovery. Needless to say, Rosalia’s father was promptly informed and in his fury he threatened to lock his daughter up in a Monastery in order to put a definite end to her embarrassing and inappropriate infatuation. 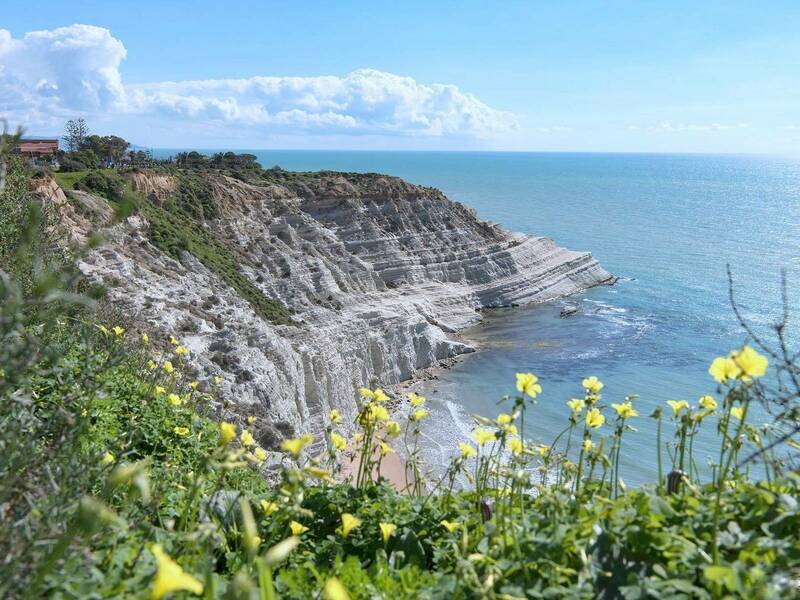 Distraught by her father’s decision, Rosalia fled from home and hid herself amongst the rocky crags on top of the Scala dei Turchi, where Peppe found her that same evening. It was a placid summer night and the two embraced each other, pledging eternal love. They threw themselves into the sea, still embraced, and disappeared amongst the waves at the foot of the white cliffs. Not long after, two rocks emerged on the very spot where the couple had plunged to their death: one is visible and the other is hidden just under the surface but connected to the first by a narrow ridge as if the the two were holding hands. According to local fishermen, if you happen to pass by the rocks by boat on calm summer evenings when the moon is full, you can hear a murmuring song: Rosalia’s voice sweetly sings of her love which was made eternal by the waves. This romantic story has stolen the hearts of local residents and for generations they have preferred calling “Rocca Gucciarda” the “lovers’ rock”. The Valley of the Temples of Agrigento is part of the largest archaeological park in the world: here the recent discoveries!